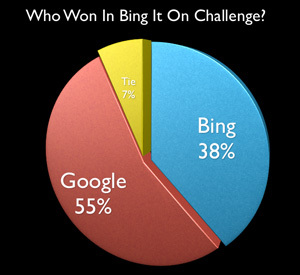 Did Bing Really Win The Bing Challenge? A couple weeks ago, Microsoft announced they ran the Bing Challenge. It was basically a blind taste test of Google results versus Bing results. Microsoft claimed Bing one 2:1 times. So I asked the readers here to take the challenge and then tell me who won. And the results said that Google won most of the time. We had about 350 results, now that is a lot less than Bing and we target a much more search savvy audience than a normal user. But only 38% said Bing won, while 55% said Google won. The rest, the 7%, was a tie. Please read my poll disclosure policy before jumping to any scientific conclusions.